How did I not know you were in Denver? Let me know if you find any of those lovely items in our markets, will you? A few years ago in Australia we did a hiking tour of the Daintree rainforest. We had all sorts of lovely fruits whose names I can't remember right now. What I do remember is the bus lurching to the side of the road because our tour guide had found a mango tree. Several had fallen on the ground and she offered them to us - I think I was one of the only ones to partake (something about ethics - whatever.) I'll have to find my travel journals to dig out the names of those other foods. wow those are INCREDIBLE looking! The Water Caltrop is positively AMAZING! i love how devilish it looks. i also appreciate your post title, "Banquet of the Bizarre"...how totally appropriate! I'm with you on the ochra! 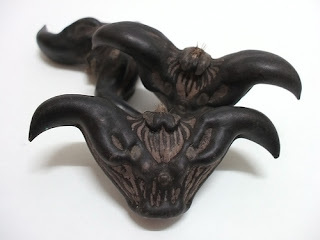 The water caltrop might give me nightmares, but everything else looks terribly intriguing. I think the Romanesco Broccoli would be my first pick if I were to try a new veggie on this list. It is beautiful and it sounds quite simple to prepare. You didn't find any of these around here, did you? 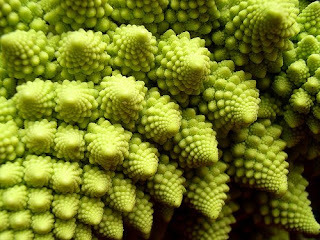 The romanesco broccoli reminds me of the fibonacci numbers. It is quite lovely. Maybe I should try to grow it? I love, love, love growing heirloom tomatoes. Some are rather odd looking, but most people would identify them as tomatoes I think. The water caltrop just is too weird looking for me to want to eat it. 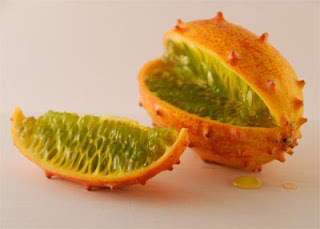 Now I think that horned melon looks an awful lot like some of the lemon cucumbers I have grown. I didn't care for all the seeds. If you can get past that, the flesh is rather refreshing. claire: Lemon cucumbers?! I'd never heard of those - googled some images and now I'm totally intrigued: did you use them like traditional cucumbers, or more like a melon? 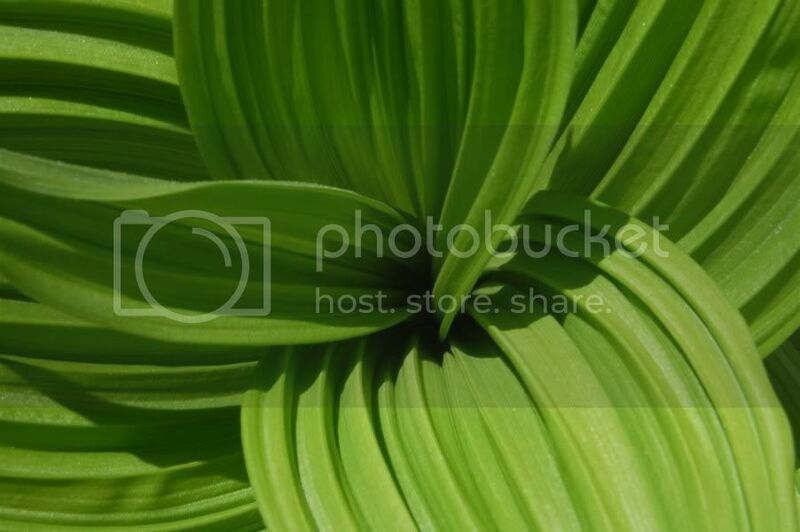 I bet that if you count the structures on each whorl, Fibonacci number would reveal themselves in the broccoli, just like they do in the spirals on a pineapple. I went back and looked at a picture I posted once and they are more round and not as bumpy. 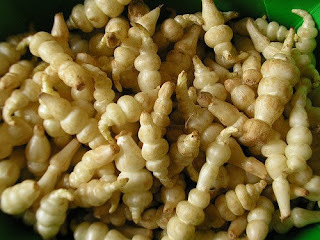 We eat them in veggie salads and they do have a lemony flavor. They are a pain in the neck to peel. When I saw the broccoli, I immediately saw fractals. I wonder if the repetition continues microscopically! Thanks for the tour. If I see a mangosteen, I'll gladly plop down the cash to try it. Ahhh, Now I have to have a mangosteen. I wonder if they're in Dubai? I have to look. You haven't tried okra the way I cook it. Basically, saute onions and garlic in olive oil. Add tomato sauce and okra, and chicken bouillon cube. Simmer for 3 hours and serve over rice. Yum. I have developed an email group for all the writers I know. I will use it to announce "Author's Weeks" on my blog. When I send out the email, I send it as a BCC so there is privacy for everyone (nobody's name shows up in the address line). I wanted to know if I could include you in this group? If not, that's okay. I'll pop over, like now, and let you know about these events in case you're interested. I'm having an author's week on my blog beginning Saturday. Five authors, seven days. I'll make an announcement on my blog on Tuesday or Wednesday. That is some incredibly wicked looking food. Anthony Bourdain's got nothing on you! But obviously, EOH, you've never had fried okra with green tomatoes, a southern staple that I recall as absolutely yummy. Three things I can't find in Montana: figs, okra and muscadine grapes. When the farmers market in Missoula opens I'll see what strange treats I can find. 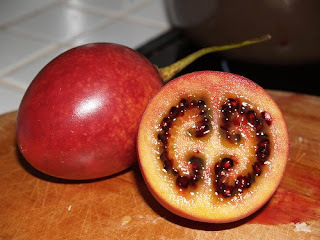 Ek het al Tamarillo geëet. En deesdae kry mens ROOI aartappels in Suid-Afrika. Dit lyk actually soos klein patats, maar dis aartappels en smaak dieselfde as gewone aartappels. En dan is daar persimmons (ek dink dis die spelling). Dis vrek lekker! I tagged you to write a six word memoir. It's easy and fun. Hey, EOH! 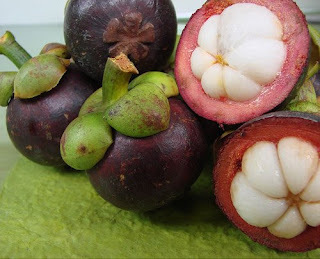 I just had to tell you that Jason and I just tried a mangosteen. Thanks to you, I failed to overlook them when I saw them in our local grocery store this week! jason evans: - not microscopically, I'm afraid. The fractal pattern has to break down at some point. 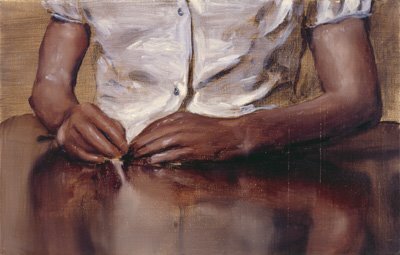 christineeldin: - okra. Still eww. angela: - oh, I adore Anthony Bourdain! I wouldn't eat all the weird things he's eaten, though. Like okra. arcadia: - granate is wonderlike goed. Vreemd dat 'n mens dit nie meer gereeld sien nie. sonkind: - ja, persimmons is fantasties, maar slegs as dit behoorlik ryp is. Anders is dit soos boomgom! claire: - I'll be sure to share on your blog, if you don't mind. shimmerings: - agreed. Mathematics is beautiful. Especially the edible kind! aine: - handsaw?! Couldn't have been too fresh, then. Must've dried out on the journey here. I knew you would like it!